Automation is an important part of a successful project for EV, a company that designs and manufactures hydroelectric turbines. Every project has three steps: first, EV designs a system to customer specifications, then the structure is manufactured in EV's workshop and, finally, they implement a custom control system. By using Unitronics PLC + HMI all-in-one units to automate the turbines they build, EV ensures powerful control and a great user experience to their customers. One application EV designed was a hydroelectric system in Val di Susa, TO that irrigated chestnut trees while generating electricity. Water was drawn from a dam down a 1600m penstock with a capacity of 250 liters of water per second. Part of the water was diverted to the chestnut trees while the rest went to the turbine. This entire process is controlled by a Vision1040 PLC+HMI. EV uses the Trend features to monitor and record key data, like the level of the dam and the temperature of the bearings. Another big advantage is the PLC's connectivity and easy communications; the Vision1040 is connected to variety of sensors and drives, using several different protocols, including Modbus RS485, CanOpen and Ethernet. The Vision1040 also communicates to a 7" UniStream PLC. The UniStream's webserver functionality allows the process to be monitored and controlled remotely from anywhere in the world. EV uses Unitronics PLCs for their reliability, ease of use and competitive prices. 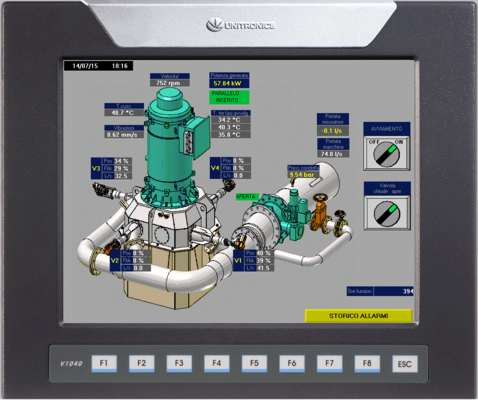 Unitronics all-in-one PLCs, as well as the all-in-one software, provide EV with a lot of value, while requiring very little effort for the set-up, installation and maintenance. Mr. Andrea Della Bosca explains "Thanks to the Programming Software and the technical support provided by Telestar and Unitronics, it has been quick and easy to set up the communication between the two systems and integrate the web site created for testing and for a continuous system monitoring."